Today the fifth peer-reviewed paper on Richard III is published in The Lancet, providing a blow-by-blow account of the injuries inflicted on King Richard III’s body at the Battle of Bosworth Field on August 22, 1485. The remains of King Richard III—the last English monarch to die in battle—were found under a car park in Leicester in 2012 by archaeologists from ULAS, and subsequently identified by a multidisciplinary team from the University of Leicester. Now, research carried out by the University of Leicester, Leicester Royal Infirmary and the Royal Armouries Museum has applied modern forensic analysis to the King’s skeleton, using whole body CT scans and micro-CT imaging of injured bones to analyse every trauma. 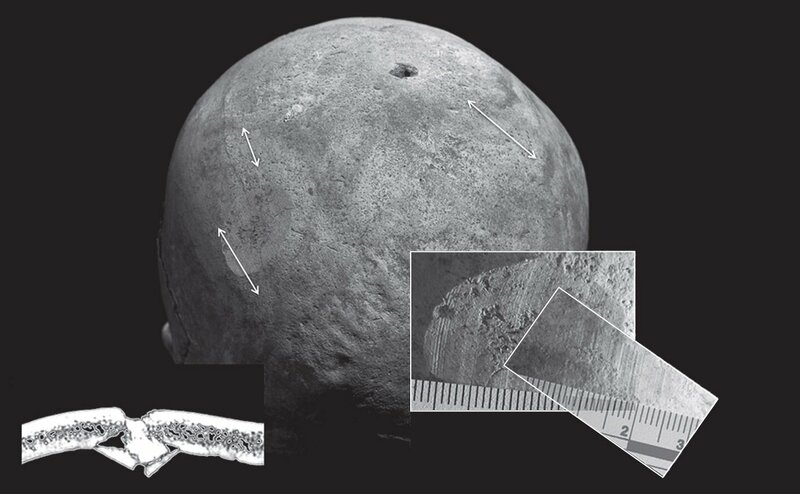 They also analysed tool marks on bone to identify the medieval weapons potentially responsible for his injuries. The research shows that Richard’s skeleton sustained eleven wounds at or near the time of his death – nine of them to the skull, clearly inflicted in battle and suggesting he had removed or lost his helmet, and two to the postcranial skeleton. Three of his injuries had the potential to cause death quickly – two to the inferior aspect of the skull, a large sharp force trauma possibly from a sword or staff weapon, such as a halberd or bill, and a penetrating injury from the tip of an edged weapon being the most likely cause of death; and one through the pelvis, probably caused post-mortem. The placement of the injuries represent a sustained attack or an attack by several assailants using a variety of weapons from the late medieval period. The wounds to the skull suggest that Richard was not wearing a helmet but the absence of defensive wounds on his arms and hands indicate that he was otherwise still armoured at the time of his death. Richard’s head injuries are consistent with some near-contemporary accounts of the battle, which suggest that Richard abandoned his horse after it became stuck in a mire and was killed while fighting his enemies. 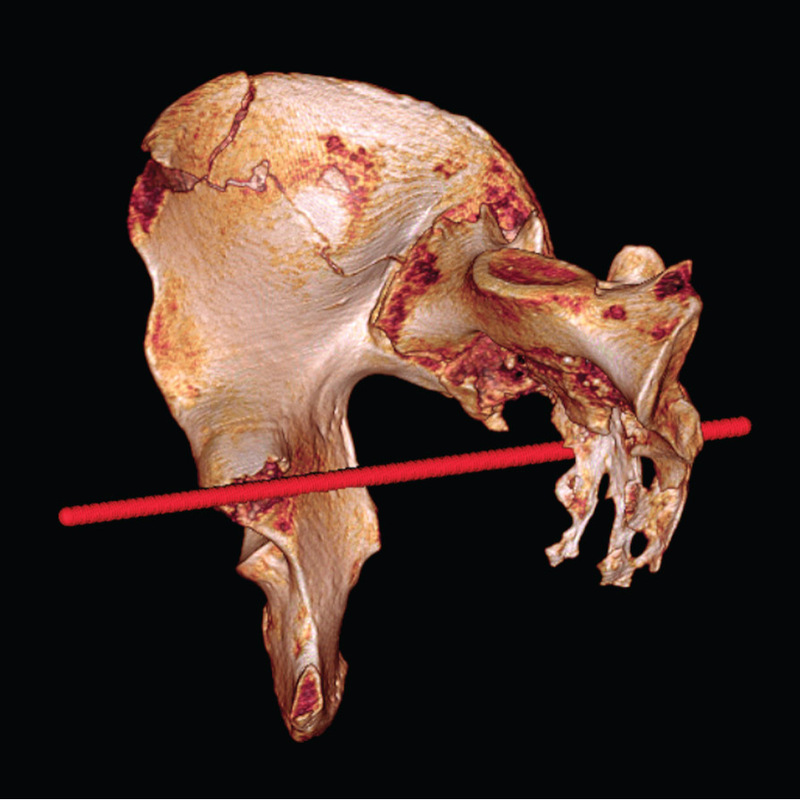 Reconstructed right hemi-pelivs and sacrum Post-mortem CT with Ositix. Red line shows estimated direction of sharp-force trauma. Credit: The Lancet. The investigation also surmises that the postcranial injuries, including the potentially fatal one to the pelvis, might have been inflicted after Richard’s death, on the basis that had he been alive he would have been wearing a type of armour worn in the late 15th century that would have prevented such wounds. Read the full article in The Lancet here or for commentary on it, why not read Mike Pitts excellent blog. I appreciate the hard work and great analysation done on this research. Thanks for putting light on these 700 years back history !